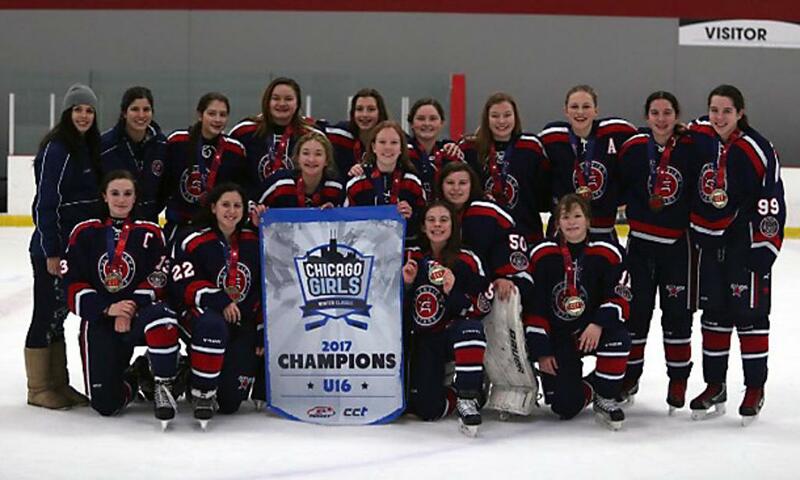 The Glenview Stars Girls U14 team swept the competition on the way to winning the Chicago Girls Winter Classic Hockey Tournament in Romeoville over the Jan. 14-16 weekend. The Stars went 6-0 to capture the tournament crown. As in other tournaments, Coach Don Cichanski's team of U14 girls opted to play up in the U16 bracket for better competition. On Saturday the Stars defeated the Eastern Iowa Lady Hawks 4-0 and the St. Louis Lady Cyclones 5-0. On Sunday the team bested the Meijer U14 AAA team 5-4 in a classic 3rd period comeback and then defeated the Cincinnati Lady Saberhawks 4-2. For the Gold Semi-final, the Stars dominated a rematch game with Meijer 6-3. The Stars then met the Highland Park Falcons U16 team in the championship. The girls played a great game en route to a 4-2 victory. This is the third tournament championship this year for Coach Don's U14 Girls team! Congratulations Stars!